Three piece kit: primary Troop Tool head with a secondary Magnum Pulaski cutting head plus the Universal Handle. 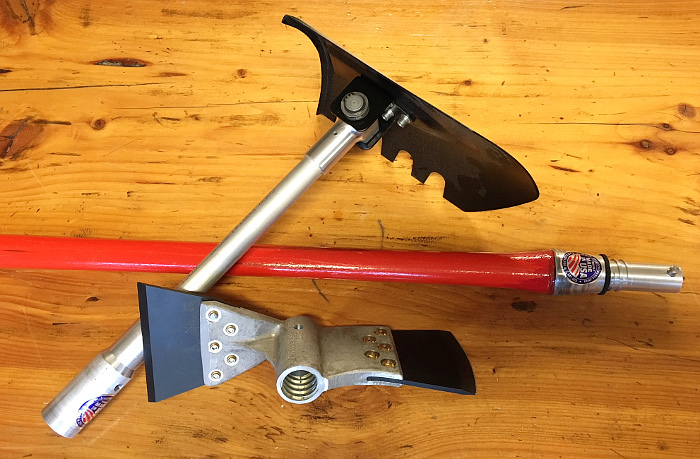 Makes the perfect set if capabilities to have one person always armed with the right tool to address most all ever changing chores on fires in the Temperate Forests. This three-piece tool kit includes Universal Handle, Magnum Pulaski, Troop Tool. Here, “TROOP TOOL”, (best Primary tool head), is joined by the, ”MAGNUM PULASKI”! This (Secondary Cutting Tool) mates up with our, “UNIVERSAL HANDLE”. This gives fire fighters more options to handle virtually any fire chore in Temperate Forests. Whether in Western Conifer or Eastern Deciduous Forests. It is the perfect, one-two punch to take care of most all wildfire chores, where fuel starvation tactics, (scraping or raking fire line) are encountered. For many decades fire fighters have asked the Forest Service to build them a Pulaski with a wider grub-hoe blade. The weaknesses of the Pulaski were many. Mostly it makes little sense to have 30,000 fire fighters bent over scraping line with a 3” grub-hoe. It was perhaps better than using a teaspoon, but not all that much better. So Dragonslayers™ built a better balanced, safer cutting tool for the people in our wildfire system who do the work. This new, better “Magnum Pulaski”, is 3” wider, 3” longer, 3 times as strong, (where the metal meets the wood). It is balanced center of mass, (where the handle goes through the device). We gave it replaceable blades, these are simply replaced when they wear down. The New, improved Pulaski weighs exactly the same as a traditional Pulaski, but it is only used when a specific cutting tool is needed. 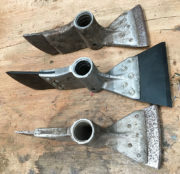 For the majority of most fire chores there is a much better “Primary”, fire tool HEAD that was engineered to keep fire fighters upright, more comfortable, where they can see the dangers they are headed into, and makes fire people far more productive. This new tool system makes fire fighters safer and at least 50% more effective. Universal Handle. 2.1 lb. Hickory, 37 ins. long. This specially engineered wooden handle with snap-lock fitting, is longer and approximately twice the strength of a traditional Pulaski handle. The hardened-aluminum CNC- manufactured male fitting locks into all Dragonslayers™ tool heads. Magnum Pulaski. 3.3 lbs. This tool is equipped with high-carbon replaceable axe and grub-hoe blades. The 6-inch wide grub-hoe blade is twice the width of a traditional Pulaski blade. The composite tool head which snap-locks onto the Universal Handle, is balanced with the center of tool mass at handle hole. The combined Magnum Pulaski and Universal Handle are the same weight as a traditional Pulaski, but with improved balance. Includes blade guards and elastic webbing with two stainless screws to attach an emergency handle if needed on a fire. Troop Tool. 3.7 lb. Tool is an adjustable angled-fire shovel for digging and throwing dirt. 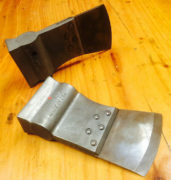 In the 90-degree blade set it is a better McLeod/Council Tool for scrapping line. When used point first it is a stand-erect mixing/chinking tool that takes the drudgery out mop-up. This tool snap-locks onto the Universal Handle, stows flat for travel and can serve as a safety staff for cross- country travel on steep and uneven ground.